People need to consider what type of hardware they want for opening and closing the door. A man turning the handle on a door. Door hardware should match the look and feel of your home as well as other metal accessories. 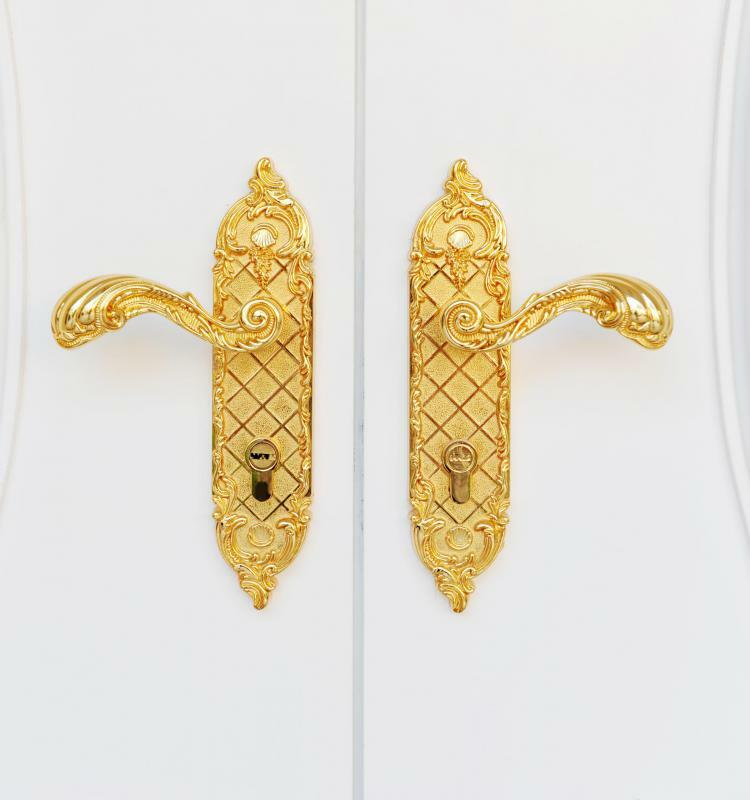 Picking out the perfect door hardware for your house can be fun, but there are several factors to consider when choosing new doorknobs. First, measure the depth, or thickness, of each door you are shopping for. This step is particularly important if you live in an old house, or are buying door hardware for an unusually sized door, such as an entry to an attic crawl-space. A standard door is 1.75 inches (4.5 cm) deep, but not all doors are created equal. You don’t want to open up the package just to find that the doorknob is the wrong size for the door. Next, consider what type of hardware you want for opening and closing the door. 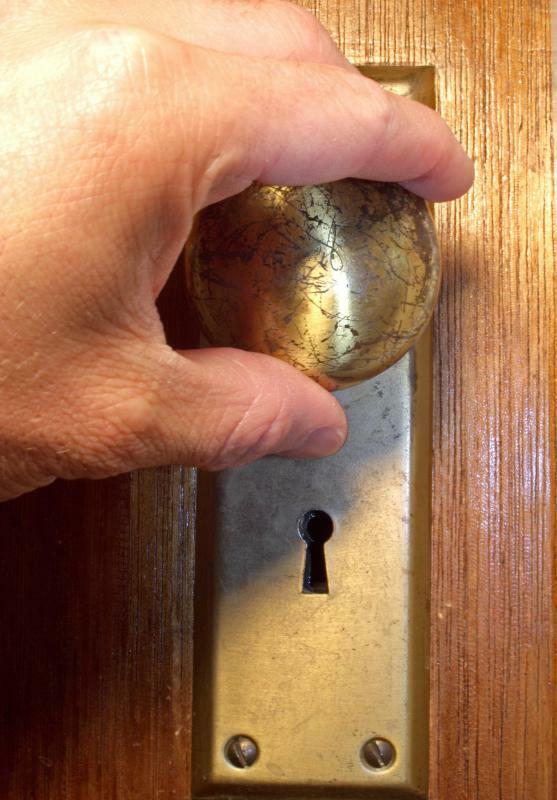 Doorknobs are the usual choice, but many people find levers easier to operate. Consider who will be using the door before choosing what type of hardware to buy; a lever will provide easier access for small children, elderly folks with arthritis, and others with limited physical functioning. Typically, exterior doors utilize a dead-latch and a dead-bolt, keyed on the outside, with a thumb-turn or turn-button on the inside. When choosing interior door hardware, consider whether you want the door to lock, and how secure the lock should be. Never install the keyed side of a lock on the interior of a room, as a person could get trapped inside if they don't have a key. Putting thumb-twists or turn-buttons on the inside of every locking door helps ensure that everyone can get out quickly in the event of an emergency. Consider how you want your door to look. Do you want reproduction 19th century hardware to match the period of your house? Would you prefer silver or brass, a shiny finish or dull? Try to choose hardware that matches the general look and feel of your home, taking special note of any other metal accessories near your door. A shiny silver doorknob will look out-of-place between two burnished brass carriage lights. Choose sturdy hardware that will hold up to heavy use. Most modern hardware is treated with a special coating called physical vapor deposition (PVD) that protects it from environmental conditions, but still, certain finishes show marks and smudges more easily than others. Consider how much time you are willing to devote to maintaining it, and choose accordingly. Buying high-quality hardware from a well-known, reputable company and giving careful thought to the considerations mentioned below is the best way to ensure that you will not be shopping for new doorknobs again soon, not unless you want to, that is. What are the Different Types of Pocket Door Handles? What is a Screen Door Latch? What Should I Know About Installing Interior Doors?